One of our Greensboro paving crews is pictured installing the surface course during the final phase of a 4-phase project for Kisco Senior Living, at its Abbottswood at Irving Park community. We have been working through Samet Corporation, the project’s general contractor, as they finish up the expansion of the community. The scope of work was originally planned as a simple mill and fill of the drive lanes, with sealcoating in the parking stalls. Once work began, we noticed signs that we may encounter conditions necessitating additional work once the deteriorated pavement was removed. By encouraging Kisco to employ a geotechnical engineering firm, recommendations were made as to the sufficiency of the original scope of work and how to proceed if additional work was necessary. 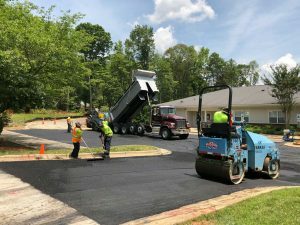 In the end, we were able to successfully work with the customer, general contractor and geotech to implement budget-conscious remedial subgrade work that ensured a quality, long-term repaving project while minimizing the additional downtime of the parking lot and disruption to the facility.